Central Bank Governor Dr. Indrajit Coomaraswamy yesterday called on the Government to ‘stay the course’ to avoid any downside risk to economic stability, and the framework that has been carefully put in place to meet the urgent needs of the people. 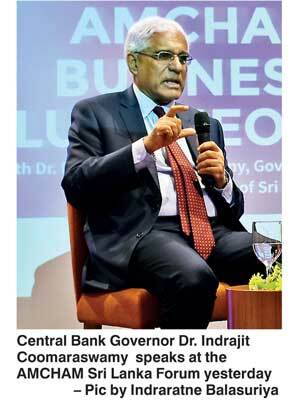 Emphasising the fact that stabilisation of economy doesn’t necessarily ‘win elections’, he said it was important still to pursue the journey and urged the people to now press on politicians with important economic reforms in the areas of investment climate, trade promotion, trade facilitation, trade policy and so on. “The headline message one could give is until a week so ago, there was a degree of stabilisation that was taking place as far as the economy was concerned. Now we have got to convince the politicians that they have to ‘stay the course’, make adjustments that need to be made to meet some of the urgent needs of the people, within this overall framework that has been carefully put in place,” Dr. Coomaraswamy said, delivering the keynote address at the AMCHAM Business Luncheon meeting held in Colombo yesterday. He said ‘technocrats’ have to convince the Government to deliver results so that they don’t lose what the country has gained in terms of stabilising the economy. Noting that the situation is manageable, the Governor asserted that Sri Lanka does not have sufficient fiscal space to take any risk. “We don’t have any margin, we don’t have fiscal space, we don’t have any buffers on the external account — so we are kind of on the edge. There is absolutely no reason for us to go over the edge and for that we need to maintain the fiscal discipline that has begun to come in,” he stressed. Justifying the degree of stabilisation that has taken place, Dr. Coomaraswamy said up to November 2017, for the first time since 1953 there has been a primary surplus in the Budget and this year they are expecting a surplus in the current account of the Budget for the first time since 1987. “I am not sure how it is finally going to end up because we still haven’t seen the December numbers, but if you look at different areas on the fiscal side some of the structural problems, we maintained to pull though by staying to the course. The way we have been progressing over the last 18 months has been encouraging. The VAT reforms, the Inland Revenue Act were major achievements were important structural changes the Government undertook. I think they will help to give momentum to the revenue based fiscal consolidation that is essential for the economy,” he added. When the Inland Revenue Act begins to kick in after April, Dr. Coomaraswamy said, provided that there is no recourse to ‘populist’ policies, they are perhaps on the way to having better budgetary outcomes which will permeate through the system to deliver more sound macroeconomic fundamentals. On the monetary side, he said they need to take an independent, data-driven view of what has to be done to interest rates. “We are building up the analytical and forecasting capability within the Central Bank to be able to do it in a proactive way. Overall there is a framework that has been put in place which I hope will be basis for more predictable, consistent monetary policy in going forward,” Dr. Coomaraswamy said. However, the Governor asserted that they still don’t have sufficient room to relax monetary policy at the moment. As a reflection of the emerging stability, Dr. Coomaraswamy pointed out that Sri Lanka enjoyed a healthy inflow of non-debt creating foreign money coming to the account through the net inflow to the stock market, and net inflow to Government securities market. He also added that according to the latest Central Bank biz outlook survey, for the first time, the indicator went above 100 for in the first quarter of this year after several quarters of negative readings, which seemed to indicate that the domestic business outlook was also improving. “Now clearly it is the responsibility of the Government to give a clear signal that they are going to have continuity and consistency in their policy approach. Hopefully they will do that in the coming days,” he quipped. Despite some changes of emphasis and focus, Dr. Coomaraswamy said the overall strategy is still going to be a growth model based on private investments. In summary, the Governor pointed that the Central Bank has put in place framework for fiscal policy, monetary policy, exchange rate policy, liability management and also in institutionalising them by trying to create legal frameworks as well.